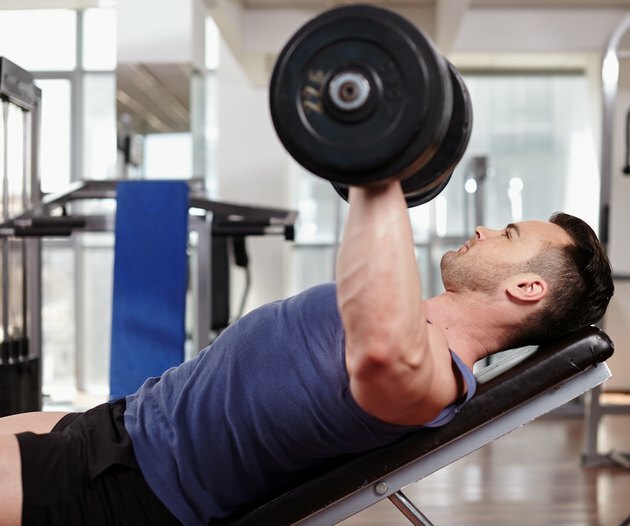 If you're a bodybuilder or a heavy lifter, you may seek a "pumped-up" look and feeling when lifting weights at the gym. When your muscles become engorged with blood, they stretch to accommodate the extra fluid – so they feel tight and you look bigger. The "pump" improves your muscle-building efforts, too. A paper published in a 2014 issue of Strength and Conditioning Journal showed that the pump correlates with increases in muscle protein synthesis, the process by which muscles grow. Proper training and eating foods with the right nutrients promotes the pump. When a muscle is under tension, blood rushes in to provide nutrients and oxygen. The extra fluid causes the muscle to look bigger, or pumped up for 15 to 30 minutes after the workout. Bodybuilders work to achieve the pump just before going on stage so the muscles look as large as possible. The pump also provides an endorphin rush for people who train seriously with weights. Generate the pump at the end of a heavy-lifting session, with a series of lighter-load, high-rep moves that target specific muscles. For example, one to three sets of 15 to 20 repetitions of biceps curls, pectoral flyes, pullups and triceps kickbacks help pump up your upper body at the end of a strength-training session. Moves that encourage a pumped-up appearance include lateral shoulder raises, pushups, leg curls and triceps dips. Do these exercises one after the other, with no rest between sets. Aim to do two to three sets of each exercise, working your muscles to fatigue. Your body naturally releases nitric oxide when you lift weights, which helps facilitate increased blood flow and blood vessel expansion to contribute to the pump. Your body may release nitric oxide through a path that uses the amino acids arginine and citrulline. These amino acids allow the blood vessels of the muscles to relax and widen, thus accommodating a greater amount of blood and fluid to encourage the pumped-up appearance. To bolster your ability to use this pathway, include more foods that contain the amino acid arginine throughout the day, especially in meals that are consumed before and after workouts. A study published in a 2012 issue of Applied Physiology, Nutrition and Metabolism showed that supplements containing arginine increased the blood volume in muscles worked after a strength-training session. Nuts, particularly almonds, cashews and peanuts, are high in arginine. Shellfish such as shrimp and crab also contains substantive amounts of this amino acid. Red meat or egg yolks are alternatives to shellfish. Another physiological pathway by which nitric oxide is released uses nitrates. When consumed right after a workout, foods containing naturally occurring nitrates are especially helpful in prolonging the pumped-up feeling for around 45 minutes. Arugula, beets, beet juice, rhubarb and dark chocolate – with a minimum of 72 percent cacao – promotes a higher concentration of nitric oxide in the blood. A 2011 study performed by Indonesian researchers showed that after only 15 days, participants who consumed 1 ounce of dark chocolate a day experienced higher nitric oxide serum levels, when compared to participants who consumed an equal amount of white chocolate. Consuming carbohydrates before your workout further contributes to the full, pumped appearance brought upon by increased blood flow. Your body converts carbohydrates into glucose, which is then stored as glycogen in your muscles. Along with this glycogen, the body stores a small amount of water -- helping the muscles to look full and engorged. Quality carbohydrates that contain fiber give you with the energy you need, but they release it slowly, so it lasts throughout your workout. A small serving of protein, along with the carbohydrates, provides an early delivery of essential amino acids that support the muscle-building and recovery process. Before your workout, have a baked white or sweet potato with an egg, a serving of brown rice, with a couple of ounces of chicken on whole-grain bread with a bit of peanut butter or some tuna salad. Highly refined carbohydrates, such as white bread and pure sugar, digest too quickly to promote a long-lasting pump. They give your muscles immediate energy, but your body can’t use all the carbs at once. The extra carbs get stored as fat, which doesn’t contribute to a cut, pumped-up looking physique. Consumption of whey protein after a strength-training workout helps muscles repair and recover. A paper published in a 2010 issue of Nutrition and Metabolism concluded that whey protein helps increase muscle protein synthesis, as well as potentially hastening recovery and decreasing soreness. Whey may not provide the immediate post-workout pump, but it does promote long-term muscle growth. Water intake also plays a role in muscle pump. When you're adequately hydrated, blood flows more readily and can rush to the worked muscles to create the pump. Spread out your fluid intake across the day, with a concentrated 32 ounces of water consumed around the time of your workouts. Can You Keep the Feeling of Muscle Pump Post Workout? Why Do I Deflate After I Lift Weights?